Does it physically exist like things I can touch or perceive? Time flies as all us old folks say – I will be 75 years old in September. The “past” in my memory is fixed. The “future” is open and unknown. The “present” is this moment – and by the “time” you finish this sentence the “present” will be the “past”. So does time physically exist or is it a mental construct? Things I can touch and describe “exist” for me. Certain things I cannot see or touch, such as gravity, but which have an effect I can describe “exist” for me. I don’t know what causes gravity but I know intuitively it is there. I can see light and I know it “exists” even though I can’t touch it like this keyboard. But “time”? Our mental concepts of gravity and light coincide with real things. How do we conceive time when there is no physical interaction and we cannot describe it? It fails both conditions of a physical reality. But the clock tells us the time! Well not exactly. 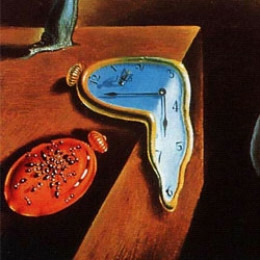 When we look at a clock we are seeing a physical object which is in motion. It’s the batteries and springs which make the hands go round. Not time. And “time” continues in our head even if all the clocks stop. The sun still rises. Oh wait. That’s not time. It’s motion. Is “time” the mental byproduct of the physical reality of motion? Einstein did tell us that time runs differently depending on motion and the observer – that motion controls time. Is motion therefore the main physical actor of the universe? I’ve gotten old. The body I was at 20 is no longer the same. This fact however has nothing to do with “time” – it has to do with cellular regeneration and perhaps the Second Law of Thermodynamics – the movement from order to disorder. If “time” is non-physical then it doesn’t exist – it is a mental construct – it exists only in our heads. Moment to moment, as you read this, nothing (and I mean nothing) remains the same. All is in motion. Everything moves from sub-atomic particles to the leaves on the tree in your yard to the earth revolving on its axis, around the sun, the sun moves in the galaxy, the galaxy moves in the cosmos, the cosmos expands. All moves from order to disorder to equilibrium. Those in the “know” on these subjects do not think this way. They work on “string theory” and soap bubbles of “multi-verses”. They believe “time” is “real”. “A sizable minority of physicists however believe that any successful merger of the two great masterpieces of 20th-century physics, the Theory of Relativity and the Quantum Theory will inevitably describe a universe in which, ultimately, there is no time.” Hehe. I could have told ’em thatI’ve read of experiments done with atomic clocks – one here on earth and one orbiting the planet to see it there was a difference in “time keeping”. There is – exactly what Einstein had predicted. The clock in orbit ran slower. So did the motion of orbit affect “time” Or did the motion of orbit affect the workings of the clock? Humans need to describe a moment in our memory – to place it in context with other moments – the moment before she was in my arms, the moment she was in my arms, the moment after – we give it a time. The time is a mental construct. Not a physical reality. “Time” is the definition of what our clocks measure; the mental byproduct of the physical reality that is motion. In my next post I will discuss the evidence supporting the theory that the earth is actually flat and that the sun revolves about the earth. I mean, can you deny your own eyes? You are very deep Frank, very deep. Even calendars confuse me – who created them and why? I think it has to do with slavery in some way. We are slaves to a clock that should not exist.